Top dog. Man in front. The king. To some manufacturers, the title of "World's Fastest Production Car" is essential to their existence. It may even be worth more than bragging rights. It's marketing, advertising, and pedigree all in one. There are even disputes over who can claim the current title. It wasn’t always this way. Nowadays manufacturers haul their cars in specially-constructed trailers to uber-secret test facilities like Volkswagen’s Ehra-Lessien to verify records under strict testing conditions, with only the finest in professional race drivers at the wheel. But back in the day, things were a bit different. Magazines like Motor, and its rival Autocar, would drive a car out to a runway or a track and simply see how fast a car could go, with nought but a scraggly journalist behind the controls. Occasionally, they’d set a record. Alright, this one wins by default as the first production car. With a blistering pace of 14.5 miles per hour, it’s a wonder they didn’t call it a day with this whole record-setting hooey right then and there. There’s a bit of a chronological gap between the Benz and the Jaaaag, sure, but the British cat was the first to really be known as the fastest. With a top speed of 124.6 mph it may seem a bit pokey today, but it was impressive at the time. And with 12,000 built, there were definitely no squabbles about if it was really a car for the masses. The legendary Mercedes 300SL and a couple of Astons slotted in between this and the Jaguar, but the sleek Bizzarini-designed Grifo is so desperately pretty it just had to be shown. With a Chevy V8 under the hood it had enough power to propel it to 161 mph. It’s kind of strange to think that there’s a good chance your mom’s car can do that kind of record-setting speed 50 years later. What, you think Enzo’s glory would allow some Beetle outshine Ferrari? Just one year later, the stripped-down F40 finally topped the 200 mark, with a claimed top speed of 201 mph. It’s that last “1” that makes this one special. Well, while we’re on the subject of nitpicking over records, the former was the official accepted figure, as the latter was achieved with the rev limiter disabled. Now that such limiters are considered acceptable, however, by the people over at Guinness, they may want to revise their history books. McLaren managed to hold onto the title for a staggering 12 years, but so staggering was its top speed that few manufacturers dared even attempt to come close. When Volkswagen announced that they would top 250, however, even fewer doubted that they could do it. 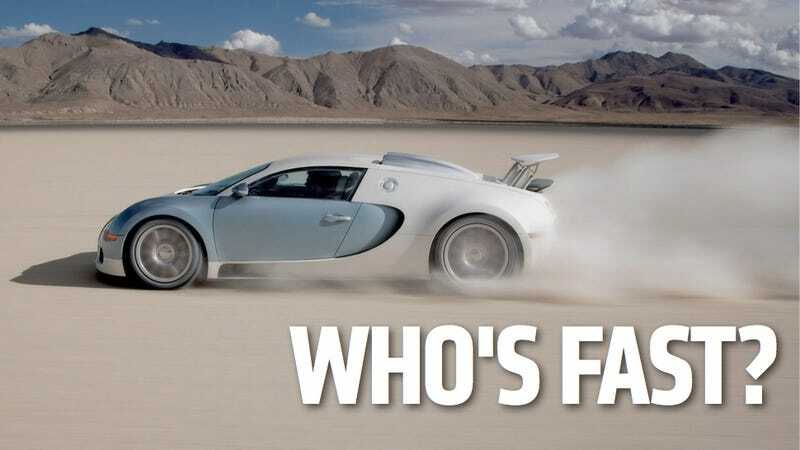 With immense monetary and technological resources behind it, VAG’s Bugatti Veyron managed to take the crown at 253.81 mph, a very precise figure for a very precise car.